Conceal electrical cords so that the rabbit cannot reach them. Exposed cords can be encased in vinyl tubing (found at hardware stores). Split the tubing lengthwise with a utility knife so the cord can be pushed inside. Give your rabbit enough attention, safe chewables and toys so that she is distracted from chewing furniture and rugs. A cardboard box stuffed with hay makes an inexpensive play box. Young rabbits (under a year) are more inclined to mischief and require more confinement and/or bunny-proofing than mature rabbits. Rabbits love boxes of different sizes, changed daily, to avoid boredom. They also love large ones in which they can hide. Although most rabbits will use a litter box, hormones may cause unneutered males and unspayed females to "mark territory." Spaying or neutering your rabbit improves litter box habits, lessens chewing behavior, decreases territorial aggression and gives your rabbit a happier, longer life. Have your rabbit spayed or neutered between ages four to six months, depending on sexual maturity, by an experienced rabbit veterinarian. House rabbits can get along fine with well-mannered dogs. Dogs should be trained to respond to commands before being trusted with a free-running rabbit, and supervision is needed to control a dog's playful impulses. 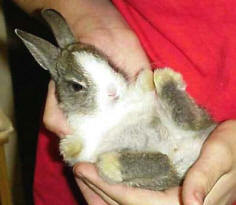 Puppies and rabbits are not a good combination as the rambunctious puppy can harm your rabbit unintentionally. Dogs should never be left alone with the rabbit until proven totally trustworthy. This is easiest if the rabbits are neutered adults of opposite sexes, and they are introduced for short periods in an area unfamiliar to both rabbits. It is best to seek help from someone experienced with rabbits. If your rabbit has been harassed by a predator, take him to a veterinarian even if no injuries are apparent. When it is over, keep your rabbit cool with nearby wet towels or ice. Because the risk is so great for predators and heat stroke/chills outdoors, your rabbit is much better off staying indoors. Indoor rabbits are much healthier, too, as you are more apt to notice any subtle changes in habits.